MyMemories Blog: Meet this week's Featured Designer! It's Mandy King!! Check out her awesome sale! Meet this week's Featured Designer! It's Mandy King!! Check out her awesome sale! Header Banner kit: Mye & Mandy New Beginnings by Mandy King!! Here are some FUN things that Mandy would like you to know about her!! I live in the Cincinnati, OH area with my husband, who is a professor and our four children, Emma, Annabelle, Simon and Eli. I taught sixth grade (and loved it) before staying home with my babies (who aren’t babies anymore!). My kids are each allowed to do one activity per season, but with four of them, we keep busy! Fall finds us on the soccer fields, winter is basketball season and they diverge in the spring…my boys play baseball (the season that lasts FOREVER) and the girls play soccer again. We are big movie watchers and have a vast collection of them that continues to grow with each holiday/birthday! I volunteer in the schools and am active in our church, teaching Sunday School and participating in the drama/outreach program. 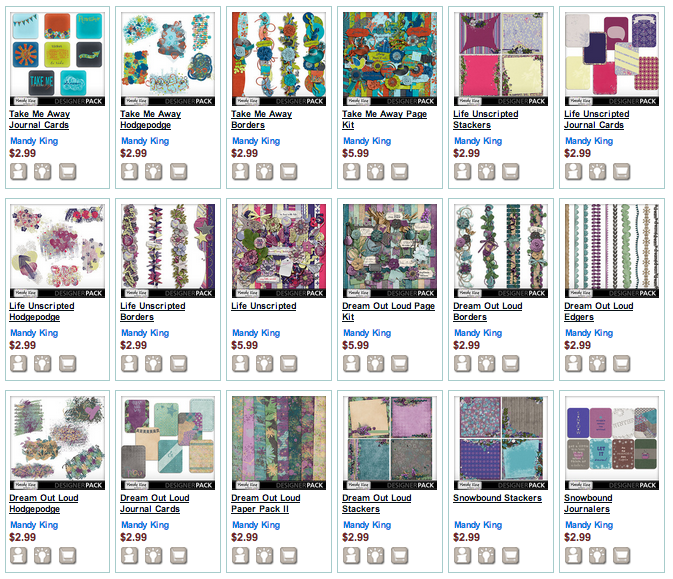 I started paper scrapping before having children (and will often joke that scrapbooking is WHY I had them) but once I discovered digital in 2005, I was obsessed! I had always messed around with graphics, starting with Print Master - and when I realized that PNG files existed, it was a dream come true! I knew I wanted to design right away, but having four kids in under five years made that a little challenging! So I read every tutorial I could get my hands on and finally, when my youngest turned one, I began selling. Now, over five years later, I’m very pleased to be selling here at My Memories! My inspiration is found in the little things from everyday living…my kids’ smiles, the books we read, the funny, quirky things they say…even from their messy rooms! When I think back to my own childhood, I remember the big events, but wish my mother had kept a scrapbook of those types of daily things. That’s what I try to capture in my designs…the ups and downs of each day! That’s exactly WHY we scrapbook…to capture and pass on memories in a beautiful way. And in doing so, we pour our heart, soul and time into it, showing our family and friends how important we think their lives are. What an honor it is for me to have my designs be a part of your memories! and remember that her WHOLE SHOP is on sale this week! Be sure to visit Mandy in all of these awesome places as well! Her kits are gorgoeous! I love the colors in her life uscripted and dream out loud kits!